In the war against microbes, Accel Disinfectants are the first line of defense for Infection PREVention. Accel provides comfort and confidence that commonly touched surfaces and non-critical instruments are rendered safe to use. Accel PREVention is the product of choice for BOTH environmental responsibility and exceptional product performance. 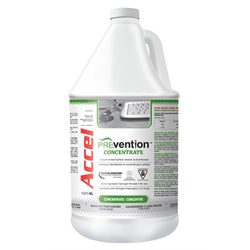 The PREVention product line provides the best balance of speed of disinfection, spectrum of disinfection efficacy, cleaning efficacy, health & safety and environmental preferability.